Hey babes! 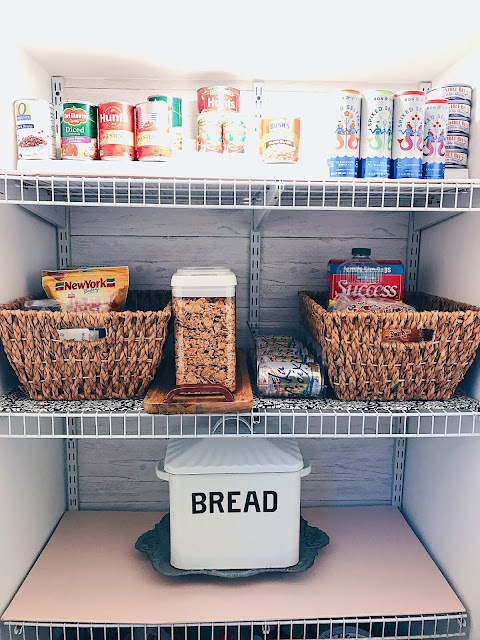 I'm so excited to share our pantry reveal with you guys today and talk a little bit about some things we've been doing to update our little casa for Spring! The Home Depot is Nick & I's favorite place to shop anytime we're looking to update things around here. They have a really great selection of on-trend products so we can create a home that's just right for us! 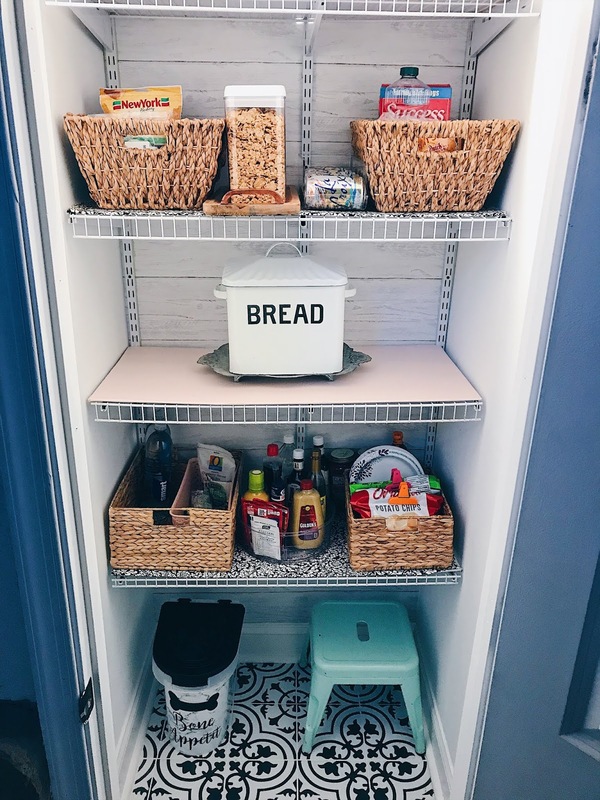 They literally are a one stop shop for all our home decor needs- I'm especially impressed with their CUTE Spring decor this year, and it's super affordable too! Winning! Seriously, ya'll need to check out their furniture line! I'm drooling over this gorgeous bed! But more on that later, right now I wanna talk about our first project we completed this year! Feeling all sorts of accomplished! 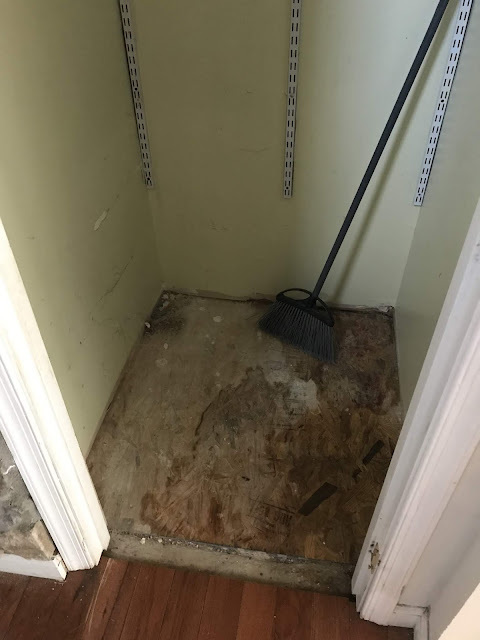 First, let's take a peek at the before. Fair warning, it's pretty scary. When we first moved in years ago I knew I'd eventually need a pantry, but creating one just never seemed like that much of a priority, mostly because it's not that big a deal and nobody really sees it, but we've been itching to get some of those "we can do that later" projects finished lately and this was one of them! Don't see I didn't warn ya! Anyway, she's looking much better these days! I have to admit I've been peeping this pattern tile for a minute, I've been wanting to use it so bad but knew it would have to be in a small space because it is SUPER trendy. VOILA! 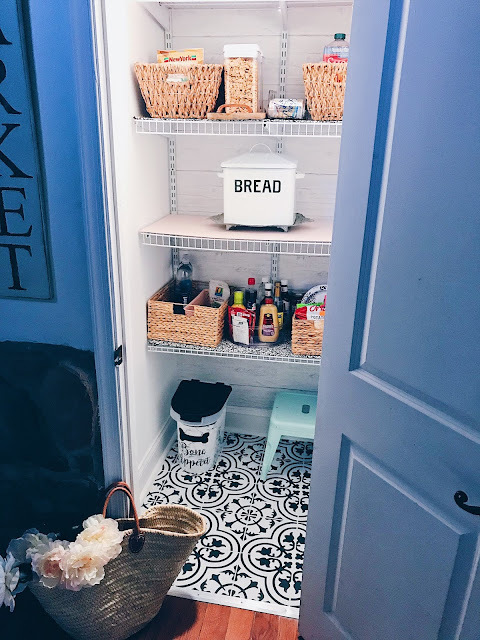 When we decided we needed to update and create a pantry space, I knew just what tile I'd use in here! I choose the black & white ultimately, but the gray is gorgeous also! I actually got to knock out two birds with one stone in here because something else I've been dying to try is some wall-paper, specifically this one that looks like shiplap and The Home Depot had a HUGE selection! But I went back and forth between the one that looks like shiplap and the one that looks like brick.. I decided on the shiplap because I figured that would be the one ya'll would most want to see and hear feedback on! Along with plenty of other cute home decor finds. It looks SO legit you guys and literally half the cost and hassle of actual shiplap. It will be easier to remove to if and when the time comes, let's face it, I get tired of things pretty quickly..
We choose a creamy white paint so we picked bleached linen, it has some pink undertones which was honestly perfect because I wanted that to be an accent color in here;) and I wanted things nice and bright in here, I really wanted to keep everything super neutral and let the tile be the star of the show in here. 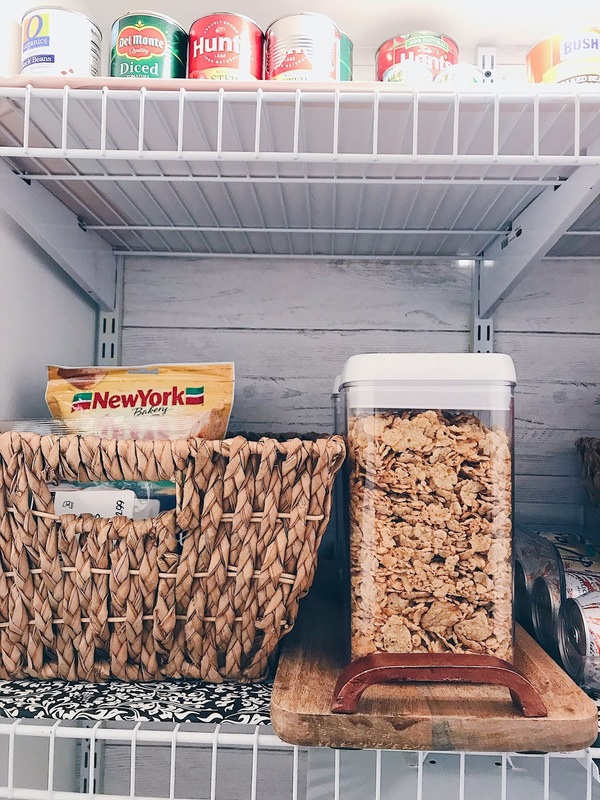 We debated wooden shelves but honestly, I really like how easy the wire shelving is to take care of and move around as needed. Sometimes I prefer practical to beauty. I've learned the hard way over the years. 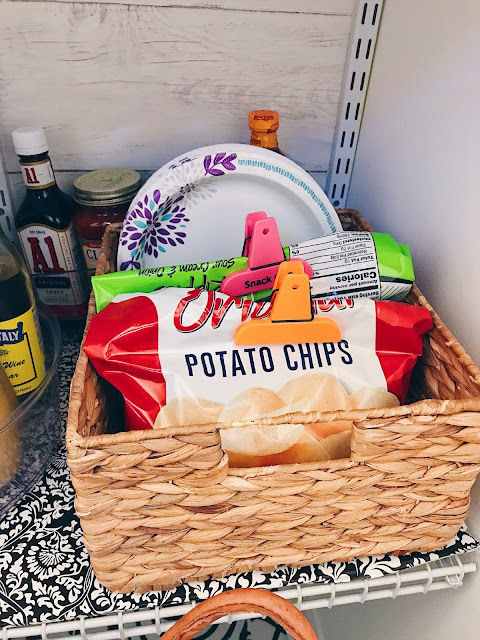 You can find the exact wire shelves we have here. 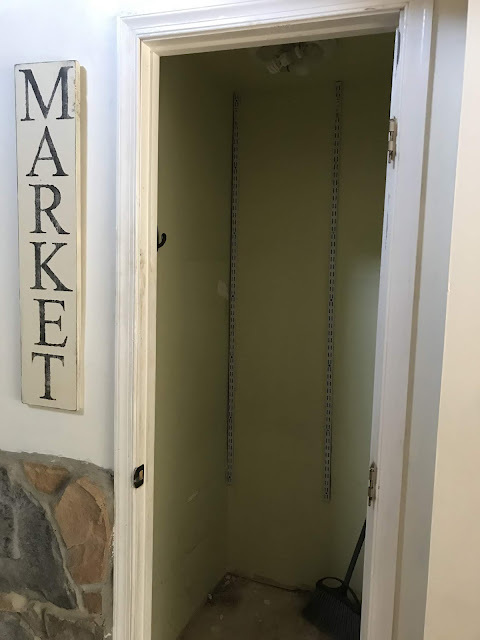 We don't have a ton of space in here so I really don't buy things in bulk, however it is super nice having this space to store things that I can't fit into the cabinets. I love keeping things in clear plastic containers! LOVE this OXO set that comes in a set of 5 or 10! The Home Depot had a great selection of those too. I just ordered these for more storage space. They were only 2 for $24! So that's it! One project finished and 200,585 to go.. I'm so excited to have this project DONE! 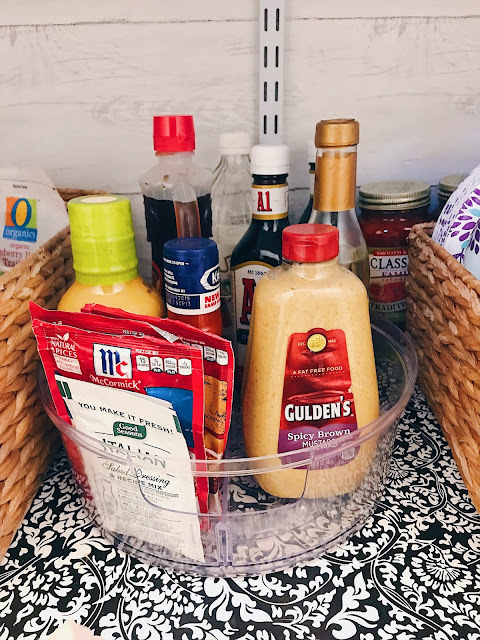 We seriously have a never ending list of things to do here at our casa, and now that the weather is getting a little bit nicer I'm excited to get them done! 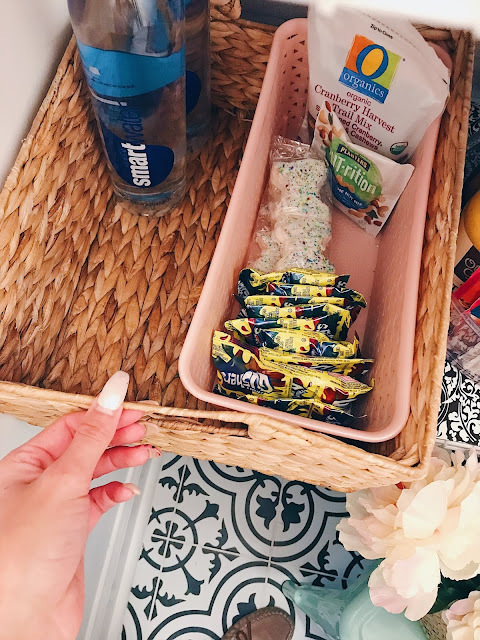 You can shop some of my favorites from The Home Depot here! I can't wait to hear what you guys think about our little pretend pantry! I love using all the spaces we have in our home! Drop a comment for me below or send me a DM on INSTAGRAM! I can't wait to chat with you cuties!! Love the tile! This looks great! I love it so much! It's pretty perfect! So happy you posted the stick and peel items! you're a God send! Girl it looks so good!! I just love it all and how bright and inviting it is. 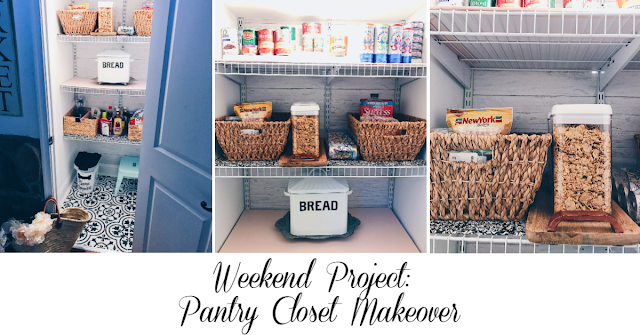 Our home didn't have a pantry either, but we really needed one so I took our hall closet (you know the one that's supposed to be for coats and stuff) and we turned that into a pantry closet. My husband was a little iffy when I first spoke about it but I told him to just trust me and that I needed it to happen.��Lol Once it was done he was immediately in love with it too and thanked me for the added organization. You really did a beautiful job!! Weekly Amazon Haul & Swimwear Try On! 6 THINGS YOU NEED TO PACK ON YOUR CARRY ON! Weekly Amazon Haul & some cute SPRING DRESSES!